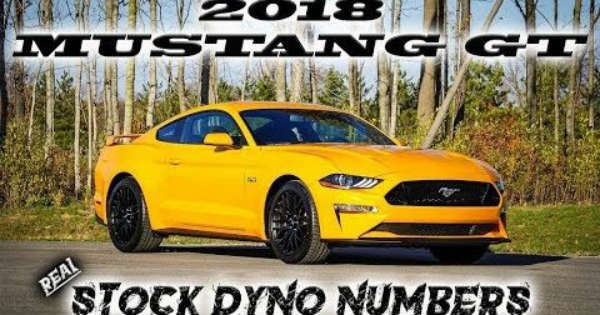 The New 2018 Mustang GT Is Here With Actual Dyno Numbers! - Muscle Cars Zone! The New 2018 Mustang GT Is Here With Actual Dyno Numbers! On the surface, the new 2018 Mustang GT shares many things with its predecessor. However, there are also many subtle differences found on this car that makes it unique. Many things that lurk under the hood are very different. In this one, its 5.0-liter V8 promises to deliver 25 more wild horses than last year`s car. This amounts to a total of 460 horsepower of the crack. Due to the fact that the engine is in the car, it is a bit hard to test crank horsepower. However, there are still ways to put the vehicle on the dyno in order to determine how much horsepower from that 460 make it to the rear. Having said this, the new Mustang GT really roars on the dyno rollers. The new 2018 Mustang GT managed to crank out slightly less than 386HP and 370 lb-ft of torque. Through the 15% rule that states that you lose that much when all the power reaches the tire, the vehicle is right where we expected. We don`t know about you, but we are more than impressed from these results. Now, we are not saying you should take these dyno numbers for granted. However, a stock car producing almost 400HP to the rear is definitely something special. We are more than happy to be a part of this automotive technology generation. Everything we found out about this new Mustang so far made us more than excited to see what the product will bring once it`s released. However, numbers can`t tell the whole picture and we are yet to see how efficient the car will really be when it comes to longevity. At last, follow this link to see one Shelby GT500 destroying the dyno! Unbelievable!